Statistics Canada is part of the Government Affairs outcome area in the Whole of Government performance frameworka transparent, accountable and responsive federal governmentthrough which the Government of Canada safeguards public trust in government; strengthens the interaction between government and Canadians; delivers services that are responsive to the needs of citizens; and implements measures to ensure the federal government is both transparent and accountable to its citizens. Although the official categorization places Statistics Canada in the Government Affairs domain, the Agency contributes to most federal government outcomes in the domains of economic, social, international and government affairs. This contribution is both direct, by informing public debate and decision-making outside the federal government, and indirect, by supporting policy formulation, implementation and evaluation within the federal government. Statistics Canada's strategic outcome, which is supported by a framework of program activities and subactivities, follows. Canadians have access to timely, relevant and quality statistical information on Canada's changing economy and society for informed debate, research and decision making on social and economic issues. 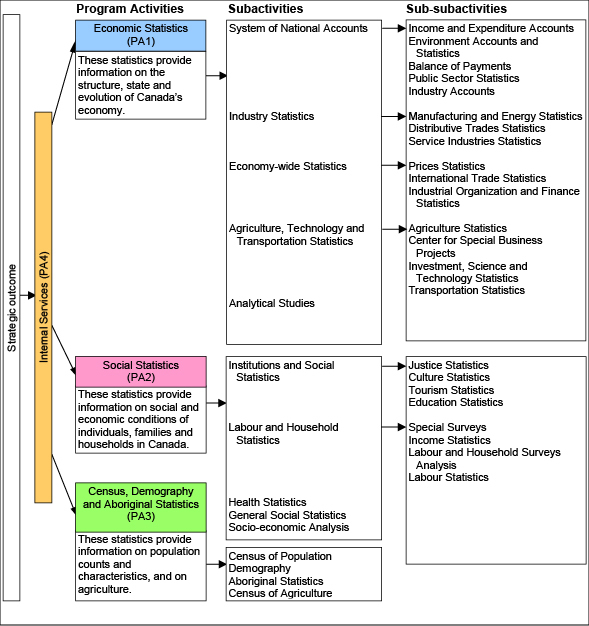 Statistics Canada's program activity architecture is shown in Figure 1.